Does Nestle Slim Dahi Make You Slim? We consume curds daily and its benefits are plenty. It helps in improving the digestive system, strengthens the immune systems, reduces vaginal infections, improves calcium levels in the body etc. Now days, we see many of them not consuming curds as its high in fat. Many weight watchers avoid it due to its thick texture and its assumed nutritive values. Nestle has come up with slim dahi and it claims to be a healthier choice. It is made with all the goodness of natural Dahi, but is now even healthier and better as it is 98% fat free and every 100g serving provides as much as 35% of your daily calcium needs. The Nestle Slim Dahi declares that they match consumer expectations by maintaining the core product deliverables of thickness, consistency and delicious taste. After taking a look at the nutritive value of regular curds and Nestle slim dahi, I am sure you are convinced that it is the better choice of the two. To give you a better insight, Nestle slim dahi is low in calories and fat, high on protein, calcium and carbohydrate. However, regular curds also provide about 35% of the daily calcium intake. The calorie difference and protein differences between the two of them will hardly make any difference to the daily intake. The only reason for buying this curd would be for its fat content that is quite considerable. A person with a normal BMI may consume regular curd. 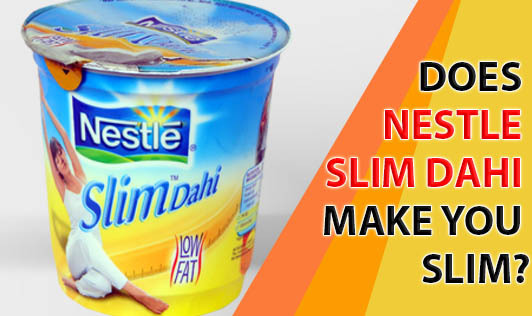 Nestle slim dahi can be consumed by a person with a higher BMI and those calorie conscious individuals. . The cost for one tin of 400g of Nestle Slim Dahi is 50 INR where as the regular curd is 20 INR for 500g (½ a liter). Slim dahi can be used like regular curd for curd preparations such as brownies, dahi vada, dhokla etc. Many studies have proven that homemade curd is better than commercially prepared curd and have more benefits on health. If you are calorie conscious, try making curd with slim milk or simply remove the cream from the curd. This can bring down the fat content to an extent. Try and set curds at home and relish its benefits.